In year’s past I have wet brined our Thanksgiving turkey along with aromatics. This is done by submerging the turkey in a solution of kosher salt, sugar, herbs, garlic, etc., for a few days to allow the flavors to permeate the meat. No more! No more, I say! I love the way the turkey turns out, but…and this is actually a HUGE but…it’s so messy and it can be hard to find enough space in an already overflowing refrigerator. Solution? Dry brining by means of a flavorful spice rub mixture. 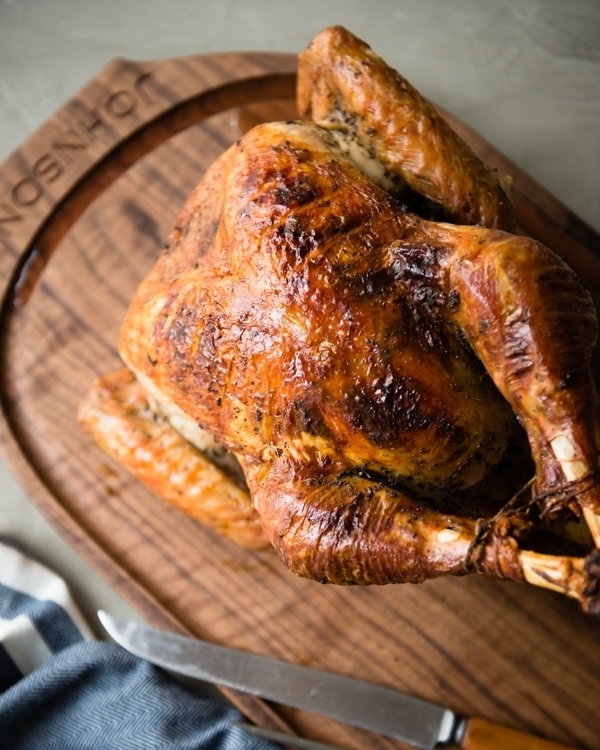 Learning how to dry brine turkey will change your life! Spice rubs are really popular when grilling, but they are also great for oven roasting. 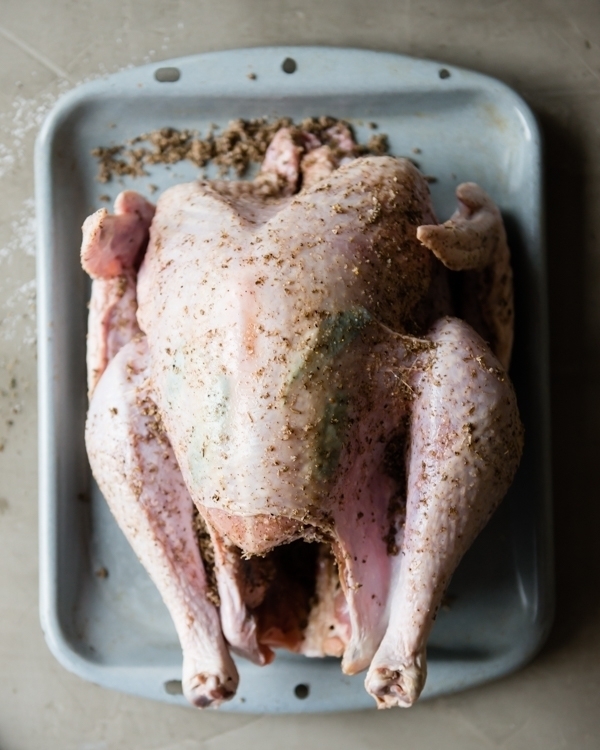 Turkey lend themselves really well to spice rubs and benefit from the time spent brining, which is very similar to marinating. Why does brining matter at all? Well, it’s a matter of science really. 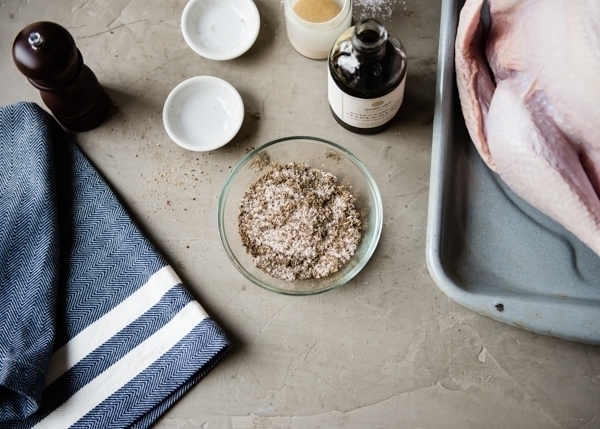 Brining works basically the same way whether or not you use a liquid solution or a dry rub. (I’m sort of paraphrasing here because I could go on and on and it would get boring.) The goal is to flavor the meat all the way through, not just on the outside. The wet brine just happens to use water, but eliminating the water and dry brining yields the same results. The spice rub I made for dry brining includes a good amount of kosher salt, which is the ultimate flavoring agent, combined with sage, pumpkin pie spice, pepper, and garlic, plus dark maple syrup. Using kosher salt is important because the bigger salt grains “melt” more slowly allowing the flavors to penetrate the turkey slowly. 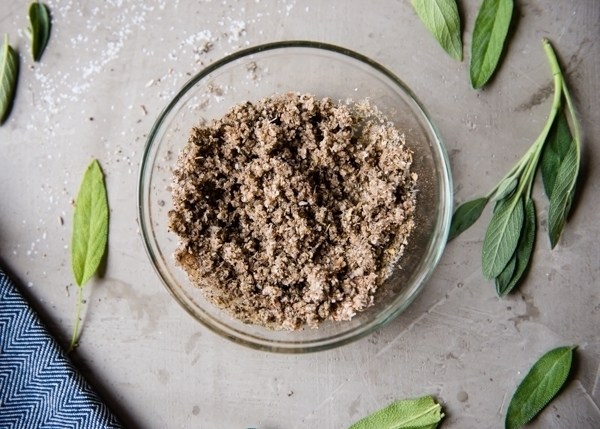 Not all spice rubs contain a sweetener, but we like adding in a little maple syrup here. 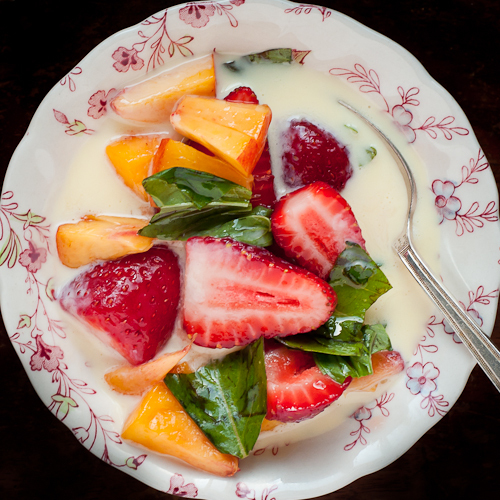 It adds the tiniest bit of sweetness and enhances the savory flavors without making it taste overly sweet. 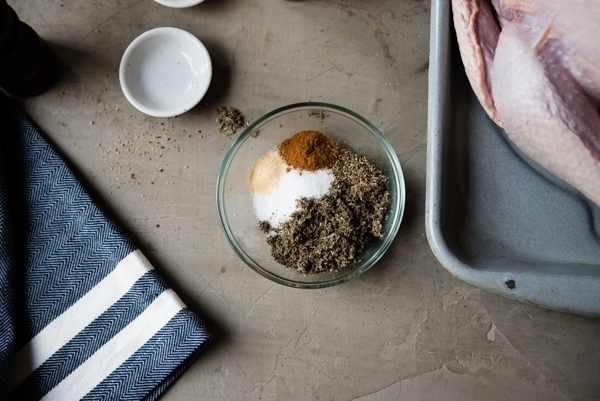 The way a spice rub (and brining in general) works is by osmosis. Salting meat draws liquid out, which may seem counterintuitive to the goal of a juicy a flavorful, yet still-juicy turkey. With salting or using a dry spice rub, the released juices get drawn back in along with the flavors from the rub and meat becomes well-seasoned. The only drawback to brining is that you don’t end up with many drippings. And the ones you do get are on the saltier side. But that’s okay – I get around this by placing onions and celery on the bottom of my roasting pan along with a 1-2 cups of water. I also make homemade turkey stock using the neck and giblets, plus a little chicken broth to make up the difference. I use the America’s Test Kitchen method for roasting turkeys. I use an All-Clad Stainless Steel Large Roti Roasting Pan with V-Rack – it’s one of my favorite pans that I own. (You can usually find it on sale around Thanksgiving for a steal.) You start with the turkey facing breast-side down then the turkey is turned onto each side for a short period of time so the legs and thighs are facing up, and then the turkey finishes breast-side up. 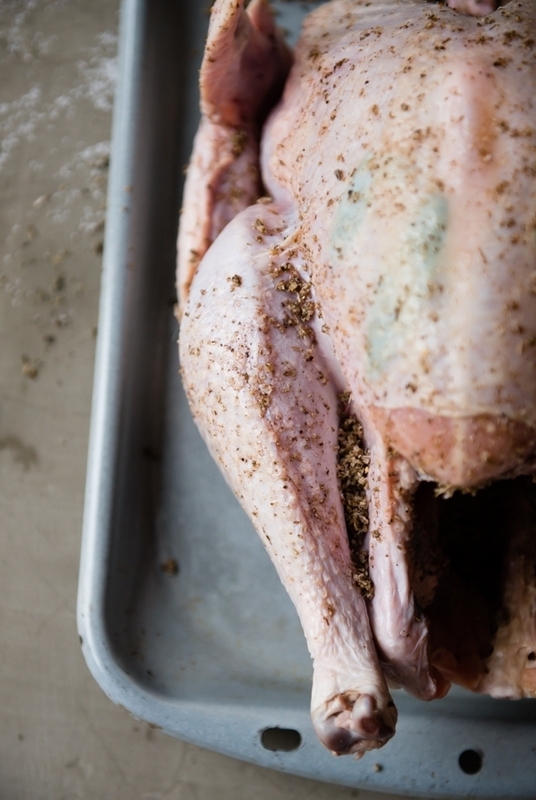 The skin gets extra brown and crispy with this method and helps ensure the white meat doesn’t get overcooked and dry out, which isn’t a problem when a turkey has been brined. I like to slather the entire turkey with butter too. 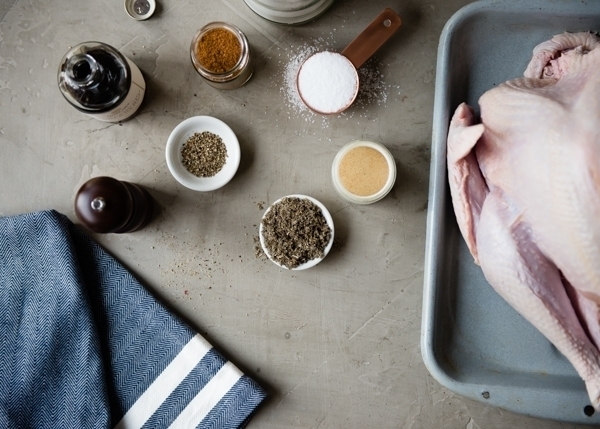 Dry brining a turkey with a flavorful spice rub yields tender, juicy meat. Remove giblets and neck from turkey. Pat dry inside and out. Set aside. To roast - preheat oven to 400°F. Have a roasting pan and rack ready to go. Adjust oven racks so they are as low as they go. Remove the turkey from the fridge and let stand, still in the bag, for 30 minutes or so to bring it closer to room temperature. Remove the turkey from the bag and discard the bag and any remaining juices. (You can rinse, but you don't have to. Pat it dry with paper towels if you do.) Sprinkle the ¾ of the onions and celery over the bottom of the roasting pan and place the rack in the pan. Place the turkey on a rimmed baking sheet or pan. Allow the skin to dry uncovered for a few minutes, or pat dry with paper towels. 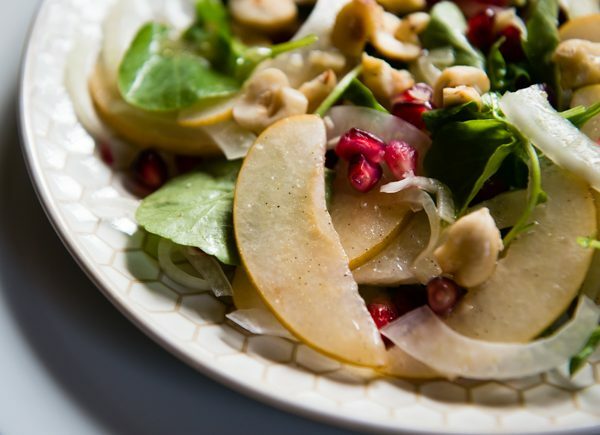 If using, place the apple slices, fresh herbs, garlic cloves, and the remaining ¼ of the onions and celery inside the turkey. Tie up the legs with twine. Spread the butter evenly over the entire turkey. Place the turkey breast-side down on the roasting rack. Roast for 45 minutes. Carefully turn the turkey onto one side, roast for 15 minutes. Repeat with other side and roast for 15 minutes longer. Lower oven temperature to 250°F. Turn the turkey breast-side up. Roast for 2 hours. 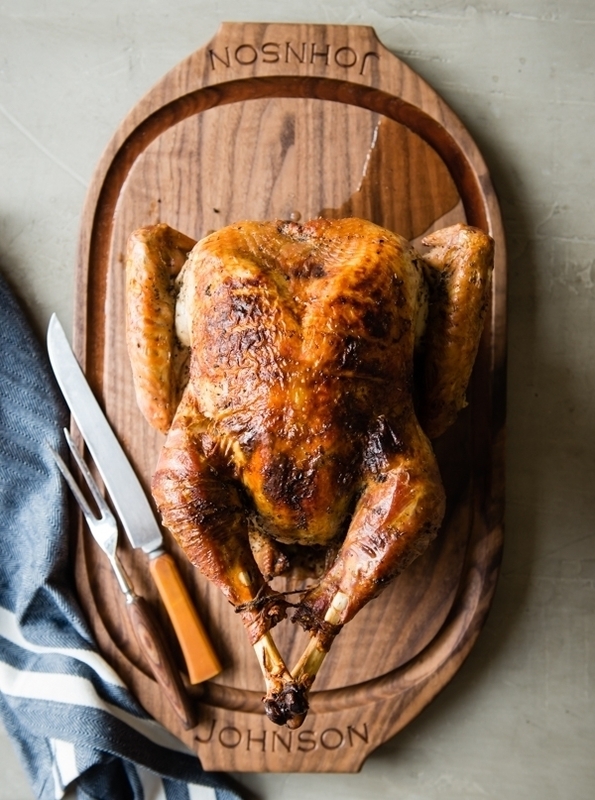 Raise the temperature back up to 400°F and finish roasting until the internal temperature reaches 165°F for the breast and 170-175°F for the thickest part of the thigh. Remove from oven and let stand for 30 minutes or so before carving. 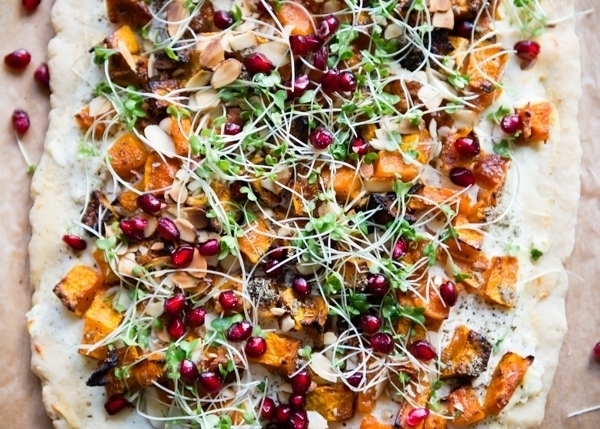 Do not use a kosher turkey for this recipe. 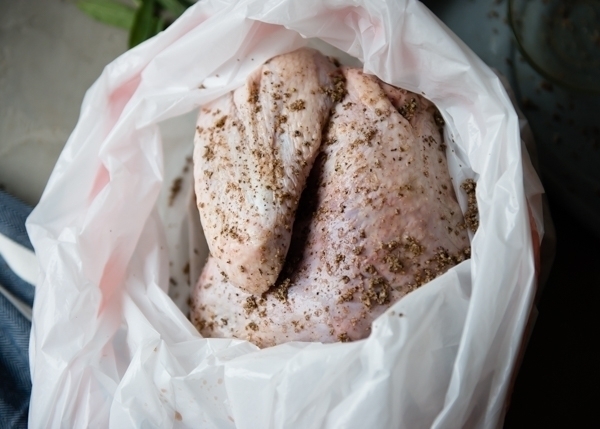 Kosher turkeys have already been brined before you buy them. 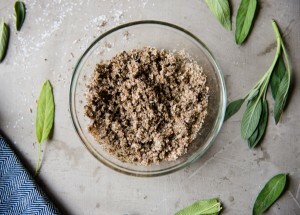 I like using dried rubbed sage because it’s less to chop and still imparts great flavor. 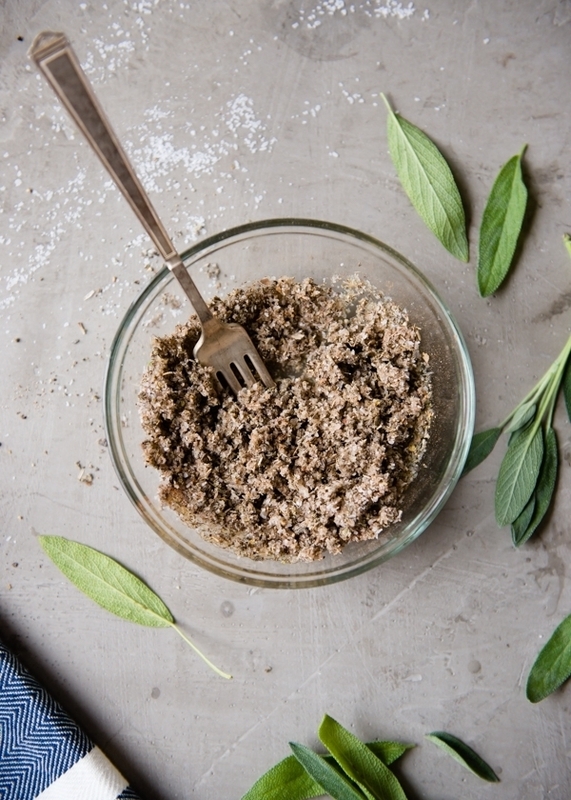 I choose garlic powder over fresh minced garlic for convenience and because I don’t like the way minced garlic can burn during the long cooking time. I do, however, place the loose whole garlic cloves inside the turkey for extra flavor while it roasts. The pumpkin pie spice adds a nice flavor, but it can be optional. 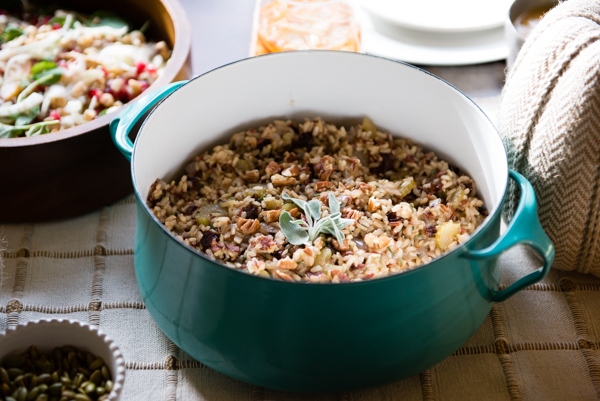 It gives the turkey an almost sausage-type flavor when combined with the sage and maple syrup. 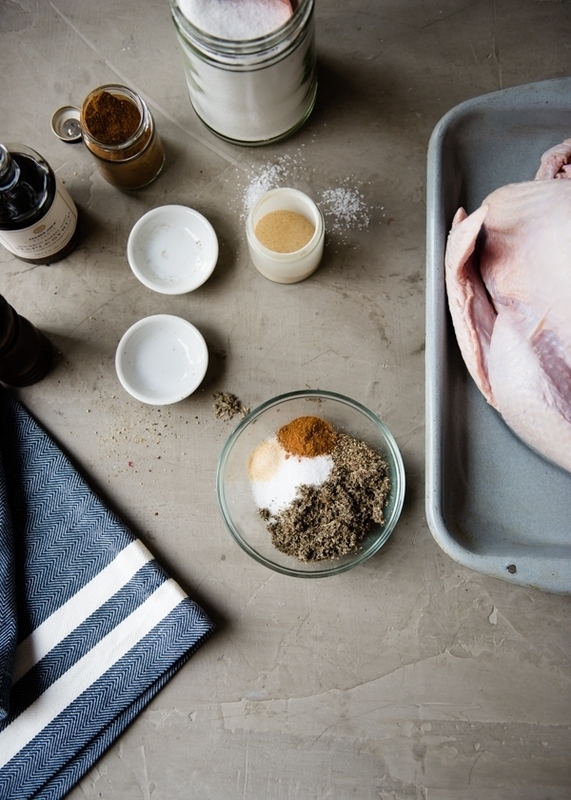 Use kosher salt because it will season the turkey more evenly than smaller salt grains like sea salt or iodized salt. In other words, it dissolves on the surface of the skin m0re slowly and evenly. 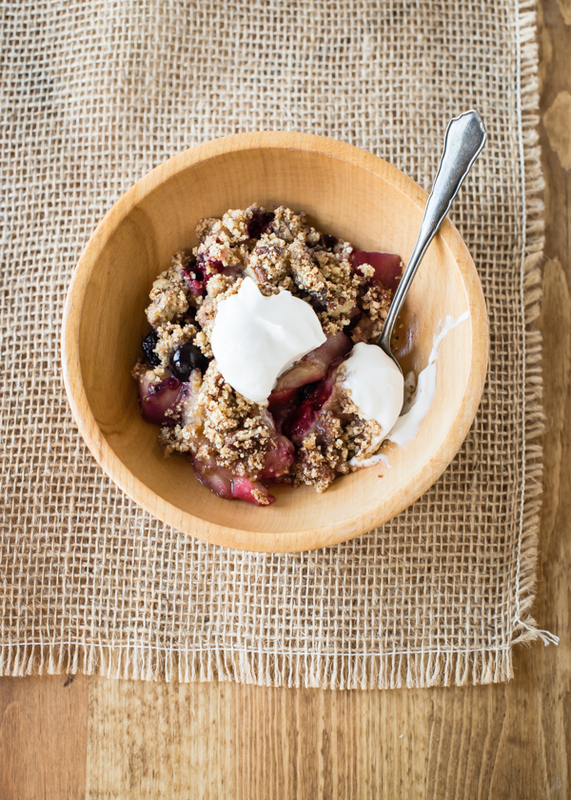 I found a really amazing aged maple syrup at Trader Joe’s that I used for this recipe. (You can find it at Amazon here.) Any REAL maple syrup will do – don’t use that high fructose corn syrup stuff. Honey would also work as would brown sugar. The sweetness of the sugar compliments the savory elements nicely and brings out the pumpkin pie spice flavors too. I read somewhere (in a magazine I think?) that if you want to place herbs under the turkey skin for decoration or to further flavor the meat, it’s best to do it before the brining process. Brining (wet or dry) changes things – the skin becomes more fragile and prone to tearing, and it can be more difficult to work with. The plastic garbage bag is such a great tool here. I’ll never go back to wet brining again! Make sure the bag doesn’t leak. Double bag if you need to, or be sure that the bag is placed either in a produce drawer or set it in a rimmed baking dish to catch any juices that escape. The bottom of the fridge is the best place for the turkey while it brines – it’s typically cooler and any escaping juices won’t contaminate other fridge contents. And that’s it! 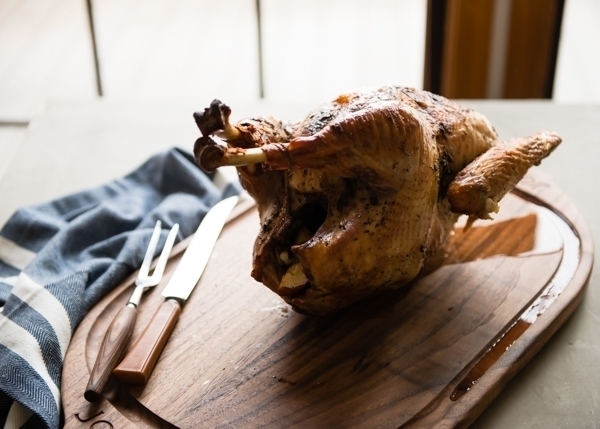 Once you take the turkey out of the oven – after it reaches the proper temperature – set it on a cutting board to rest before carving it. Keep it covered so it stays warm. Pour any accumulated juices back into the roasting pan to use for gravy. Disclosure: The post contains Amazon affiliate links. I feel like I can smell it roasting from here, yum. I haven’t done a brine like this before- great method! Do I rinse the brine before putting in oven? Hey Ashley! That is a great question. I personally do not rinse the turkey after brining. It doesn’t really make a difference as far as the amount of saltiness in the bird – that has more to do with the length of time the bird brines. I usually just pat it dry with a paper towel. If you want to rinse it, you totally can. I just prefer not to. 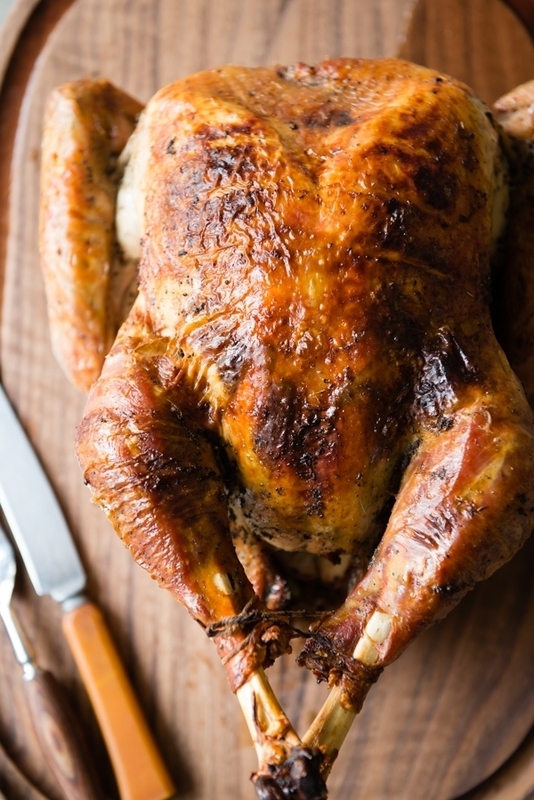 Do you cover the turkey while cooking or roast openly? I don’t personally cover it unless it’s starting to get too brown/cooked when it’s breast-side up and the dark meat hasn’t come up to temperature. I place the oven rack down as far as I can so it’s not too close to the heating element. But you can cover it – I don’t think it hurts to do that. How long will the total cook time be (roughly) for a 12lb bird? I am having a hard time trying to find dry rubbed sage. 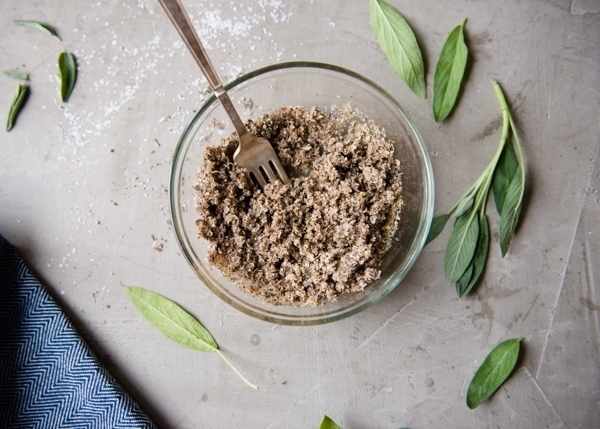 Can I substitute for chopped fresh sage in the rub? Hi Lydia! Of course. Use about double the amount of dried. Thank you so much for the prompt response! 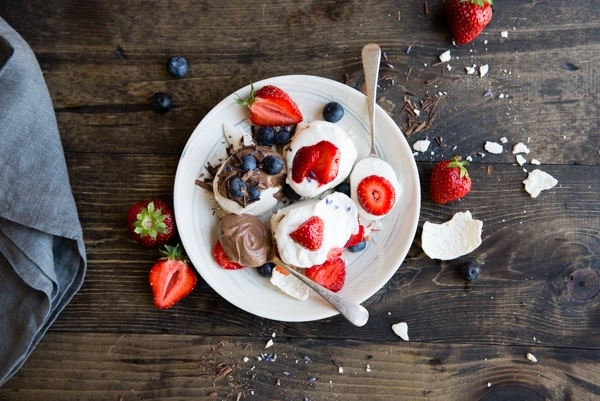 I am so looking forward to trying this recipe out! Hi, so excited about using this recipe! It’s also my first time making a turkey too. I noticed your cooking time is high compared to others, do you cook at 400* the whole time? The guide you link from Real Simple suggested lower times too, what’s your take? Thanks so much! Oh my goodness, Kaytea! Thank you for pointing that out. I completely and accidentally omitted the part about turning the heat down. I amended the recipe directions – after that initial 1 hour 15 minutes of roasting the turkey breast-side down and each side, turn the turkey over so it’s breast-side up. Lower the temp to 250°F for two hours, then raise it back up to 400°F until the turkey reaches the proper temperature, and the skin is golden brown. Doing this on a 9lb bird, and will let you know how it turns out. Thanks for the suggestion. Can’t wait to hear back, Michael! Happy Thanksgiving!